I’ve been eying up this recipe in VWAV for ages. People rave about it over at the PPK like it’s the second coming. It’s a tribute to how much I rate this book that I even looked at it, as generally we don’t like fruit in savoury meals. Truth to tell, I don’t much like fruit at all. 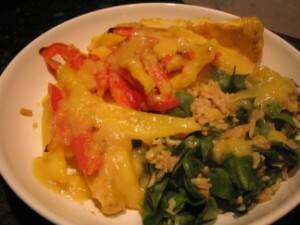 But this mango is made into a sauce with chillies, rice vinegar and other interesting things, then baked into the tofu. I’ve never baked tofu before, so this was a first on many levels! The sauce smelt a bit like those jars of baby food and I thought it was going to be too sweet, but it worked well. I served it with brown rice and spinach. It took us a while to decide whether we liked it or not simply because it was so different to the sort of thing we normally eat. But the verdict was yes, we’d definitely have it again.